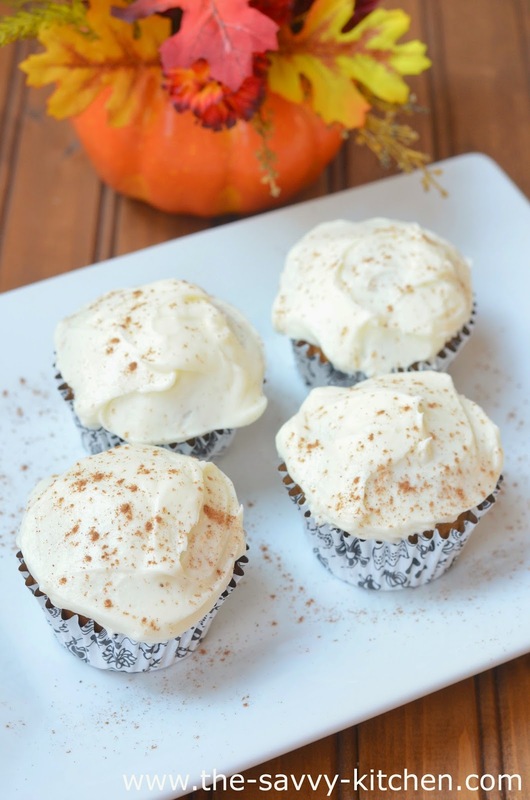 The cupcakes themselves are perfectly moist and full of that fall pumpkin flavor that you see everywhere this time of year. 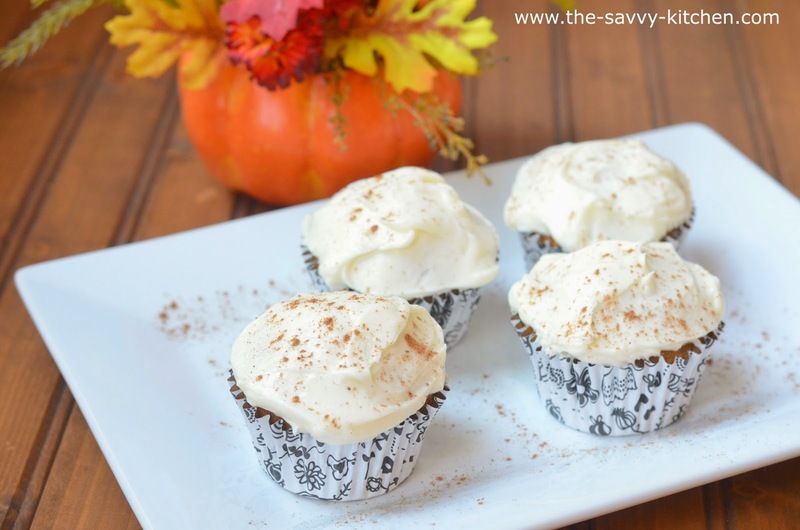 A little cinnamon and nutmeg really go a long way in these cupcakes, and the sweet frosting balances everything out. Definitely make these today! For Halloween! Go! Heat the oven to 350 degrees F and arrange a rack in the middle. Line 2 (12-well) muffin pans with paper liners. Alternatively, coat the wells with vegetable oil; set aside. Place the flour, baking powder, cinnamon, cloves, allspice, nutmeg, baking soda, and salt in a large bowl and whisk to aerate and break up any lumps; set aside. Place the sugar and measured oil in the bowl of a stand mixer fitted with the paddle attachment. Beat on medium speed until the sugar is incorporated, about 1 minute. Stop the mixer and scrape down the sides of the bowl and the paddle with a rubber spatula. Return the mixer to medium speed and add the eggs 1 at a time, beating well after each addition, about 1 1/2 minutes total mixing time. Reduce the speed to medium low, add the pumpkin, and beat until just combined, about 30 seconds. Stop the mixer and scrape down the sides of the bowl and the paddle with a rubber spatula. Turn the mixer to low speed, slowly add the flour mixture, and beat until almost completely incorporated, about 1 minute. Remove the bowl from the mixer and fold in any unincorporated flour at the edges with a rubber spatula, making sure to scrape to the bottom of the bowl. Fill the muffin wells three-quarters of the way (about a heaping 1/4 cup per well). Place the muffin pans side by side in the oven and bake for 12 minutes. Rotate the pans front to back and side to side and bake until a toothpick inserted into the center of the cupcakes comes out clean, about 10 minutes more. Place the pans on wire racks and let them cool for 5 minutes. Remove the cupcakes from the pans and cool completely on the racks. Frost with Cream Cheese Fluff Frosting. Store in the fridge in an airtight container. 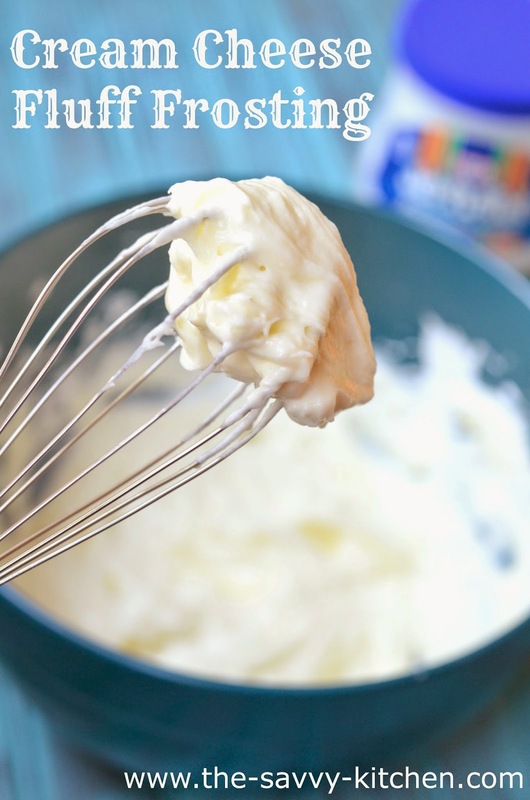 Cream cheese frosting is probably my favorite type of frosting, so I was excited to hear about this new recipe from my friend, Laura. My typical frosting is a simple mixture of cream cheese, butter, vanilla and powdered sugar. It's easy, but it takes a tad bit more time and is a little more delicate to make than this glorious mixture. Seriously: two ingredients! Cream cheese and MARSHMALLOW FLUFF!! That's all you need. 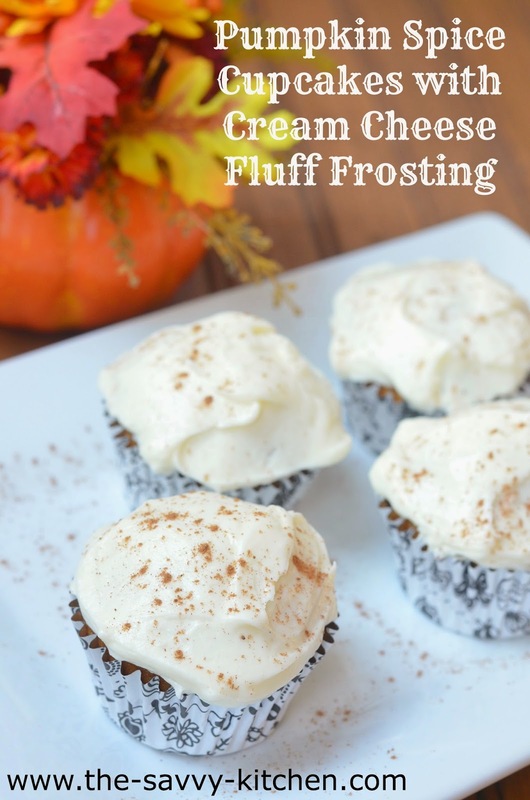 The result is a fluffy cream cheese frosting that will get everybody's mouth watering. Enjoy! 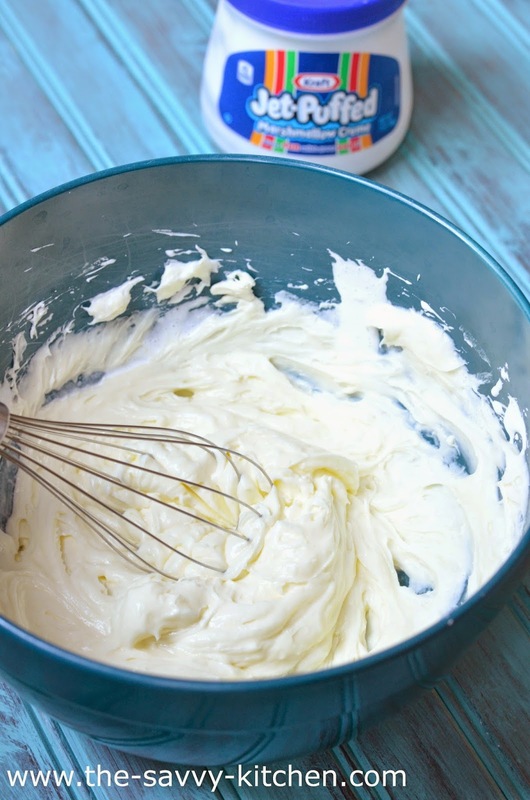 Using a hand blender, blend cream cheese and fluff in a large bowl until combined. Use to frost your favorite cupcakes! Keep refrigerated. Happy Halloween week!! I'm really not a huge fan of the holiday, but ever since I had a little nugget of my own I get really excited about all holidays. Columbus Day! YES! St. Patrick's Day...we are wearing ALL GREEN! Halloween? We're going to the pumpkin patch, carving pumpkins and roasting pumpkin seeds. So obviously for Halloween Bradley is going to wear the cutest costume ever and we are going to parade around asking for candy. And that morning, even though it's a Friday, I think I'm going to make him pancakes. Pancakes are a rare occurrence in my household (meaning they're only made on the weekends), but when I do make them I like to switch them up. Adding blueberries, chocolate chips and bananas are some of our favorite ways to spruce up pancakes. But in the fall? Pumpkin. And cinnamon. And nutmeg. 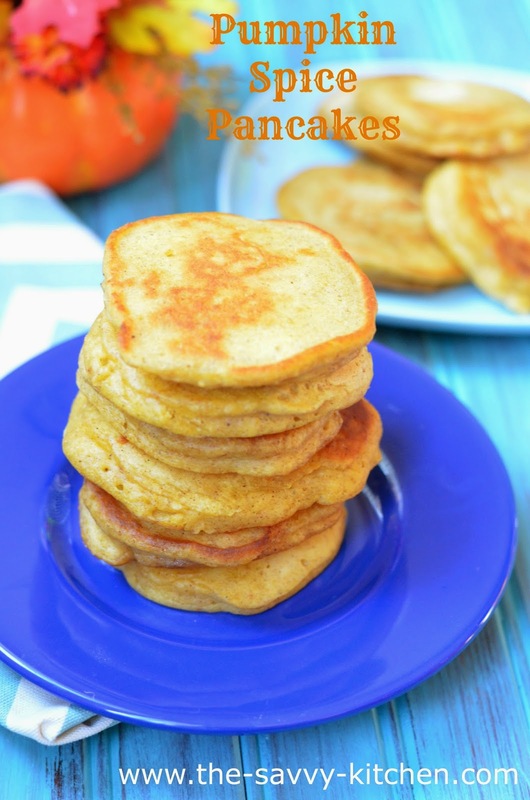 These pancakes are light, thick and fluffy. Basically all the requirements for the perfect pancake are met in this recipe. Since the pancakes already have so much flavor, I only needed a tad bit of butter on top of mine to make them perfect. 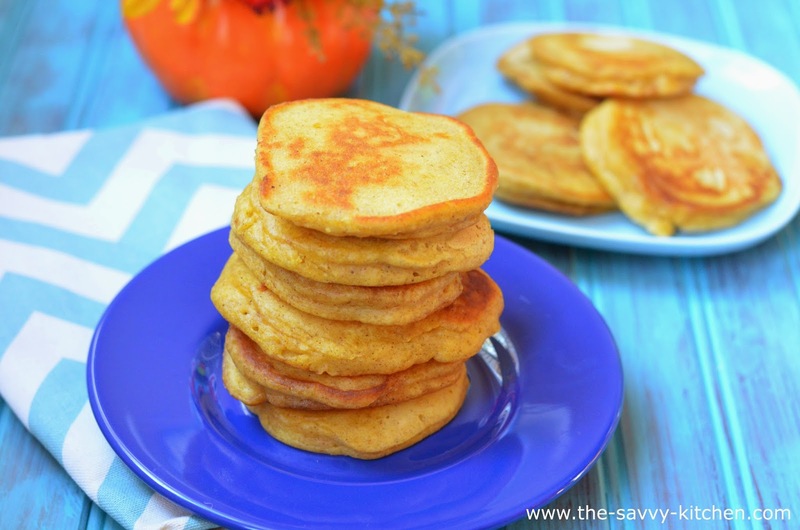 These are a really fun fall breakfast treat the whole family will enjoy! Especially on Halloween morning! In a large bowl, mix milk, pumpkin, egg and vegetable oil together. In a medium bowl, mix flour, brown sugar, cinnamon, nutmeg and salt together. Slowly add the dry ingredients into the wet ingredients, mixing well. Stir until combined. Heat griddle or pan over medium heat. Add a teaspoon of butter to the pan and allow to melt. Pour 2 tablespoons of batter in a small circle onto the griddle. Continue making pancakes, making sure pancakes are not touching. Cook on the first side until bubbles form on the top. Flip the pancake over with a spatula and cook until golden brown, adding more butter, if necessary, to keep the pan moist. Repeat until all the batter is gone. Let cooked pancakes rest on a heat proof plate in a 200 degree F oven until ready to serve. My mom makes roasted pork with apples on the regular, and since Bradley loves to eat it when he goes over there I decided to make it at home one night. I threw onions into the mix because I strongly believe that onions make everything better. Do you know that Chris hated onions when we first met? I was determined to change that, and thankfully I was able to. I put onions in almost everything, so eliminating onions from my diet would have been a difficult pill to swallow (albeit worth it). I used my mom's directions as a base to this recipe and then just played it by ear as I went. I was a little hesitant not to add any additional flavor/spices along the way, but I quickly found out that they were not missed at all. 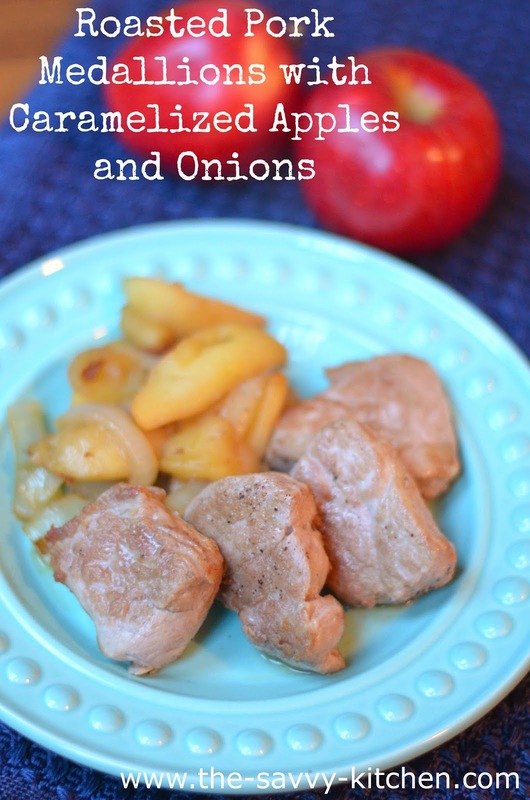 The apple and onion mixture make a great "sauce" to the pork, which gets very flavorful on its own. It will make your house smell realllly good, too. Enjoy! 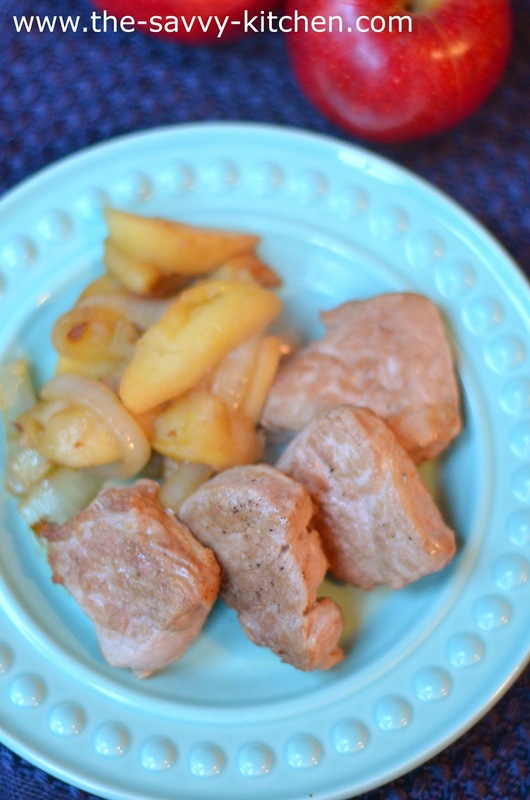 Cut the pork tenderloin into 1-inch medallions. Season both sides with salt and pepper. Heat oil in a large cast iron skillet. Add pork in an even layer and allow to sear for 3 minutes. Flip the pork and sear the other side for 3 minutes. Remove pork from pan and cover to keep warm. Add butter to skillet. Add apples and onions. Cook for 10 minutes, or until caramelized and tender. Add pork back into the skillet. 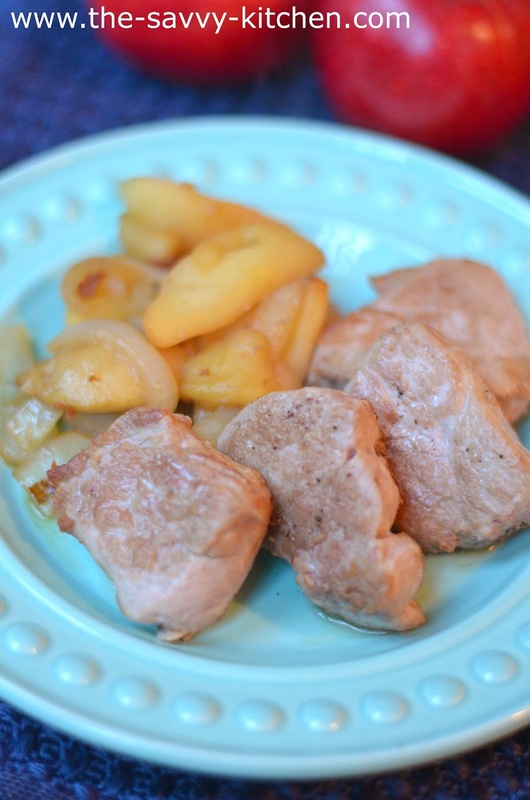 Place the skillet in the oven and continue cooking for 10-20 minutes until pork reaches an internal temperature of 160 degrees F and the apples and onions are tender. One of my family's traditions is to go to Larriland Farm in Maryland to pick apples, vegetables and pumpkins every fall. It was a little chilly when we went this past weekend, and aside from the windblown hair and runny noses we still had an awesome time. Plus this year was very special since Bradley was able to join us for the first time. He loved throwing hay while on the hay ride, picking apples from the tree, going for a ride in a wheelbarrow and making silly faces with mommy (photo proof below). I think he loved the apples most of all. We gave him a bite, and then he wouldn't put it down for the remainder of the day. I literally had to rip it out of his little hands when we were trying to put him into his car seat. Don't let his size fool you. Little man has an amazingly strong grip. I always seem to pick a large assortment of apples and am always on the hunt for new recipes to try with them. My latest concoction is an ideal fall side dish since roasted vegetables and apples just scream October to me. Bacon gives the dish some extra flavor while the apples and Brussels sprouts get crisp and tender in the oven. Enjoy! In a large bowl, add Brussels sprouts and apple chunks. Drizzle maple syrup and balsamic vinegar over top and stir to combine. In a large ovenproof skillet, cook bacon until crisp. Remove all but 2 tablespoons of grease from the skillet. 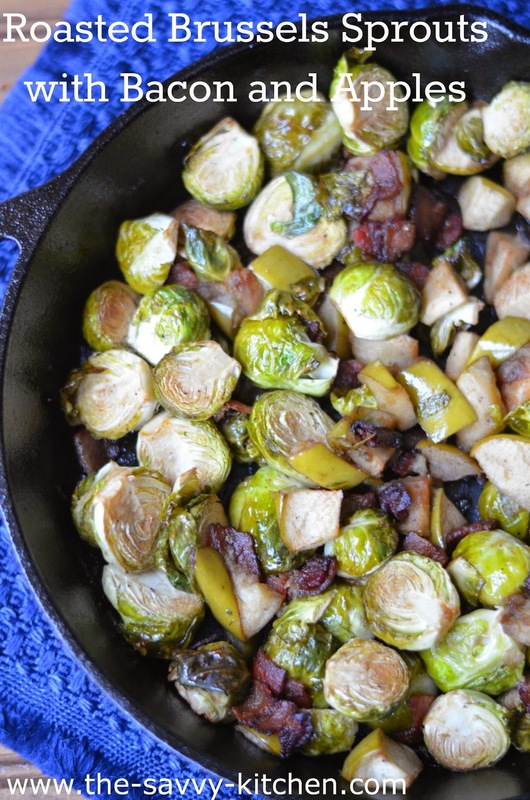 Add Brussels sprouts and apple mixture to the skillet in an even layer and stir to combine. 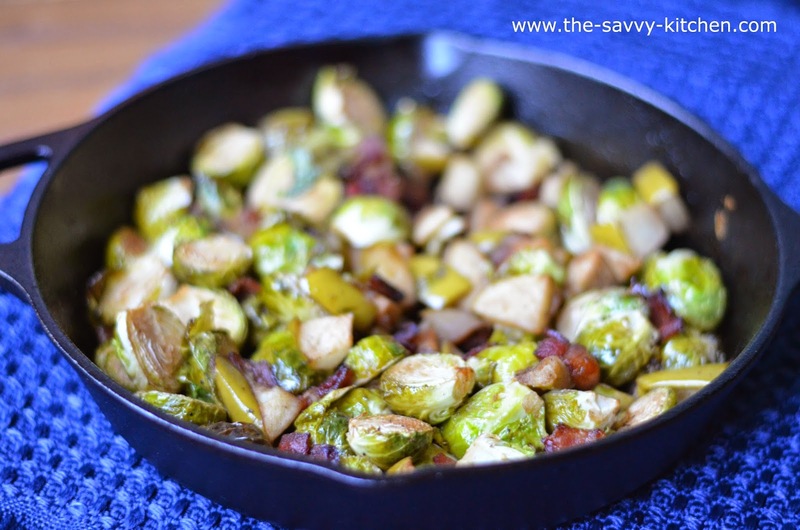 Place skillet in the oven and cook for 15-20 minutes, turning once halfway through, until Brussels sprouts are golden brown and tender. Whenever SRC time comes around, I usually peruse my assigned blog and make a list of all the recipes I'm considering trying out. For this month's blog, my list was 20 recipes long. TWENTY! And I didn't even make it halfway through the site. I straight up had to cut myself off before my kitchen was overflowing with goodies and my waistline expanded three inches. That's what Jamie's blog, Our Eating Habits, will do to you. But in the best way possible, of course. 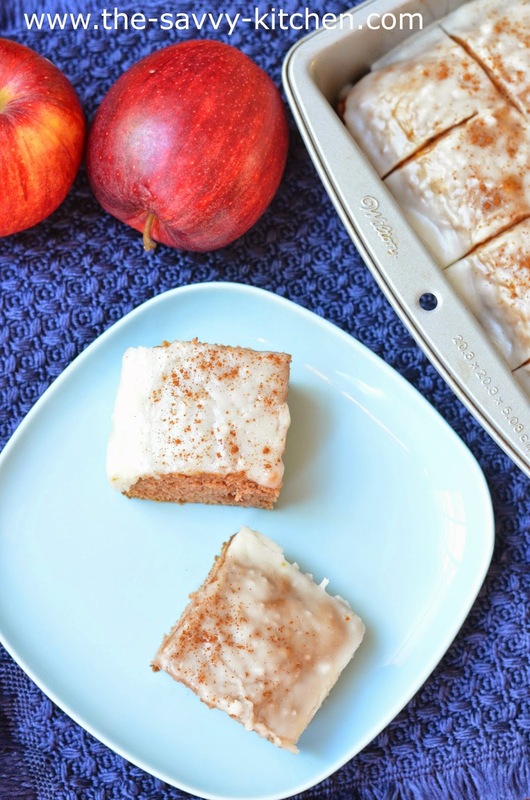 Since it's fall, I gravitated towards the apple and pumpkin recipes. 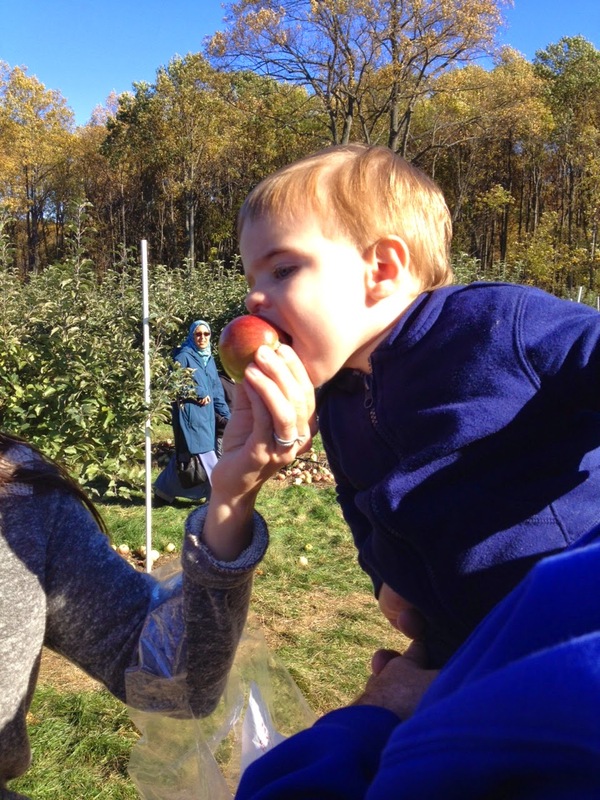 I absolutely love going apple picking with my family every year, and this year was even more special since Bradley was able to join us for the first time (last year he was there, but he was still in my belly!). 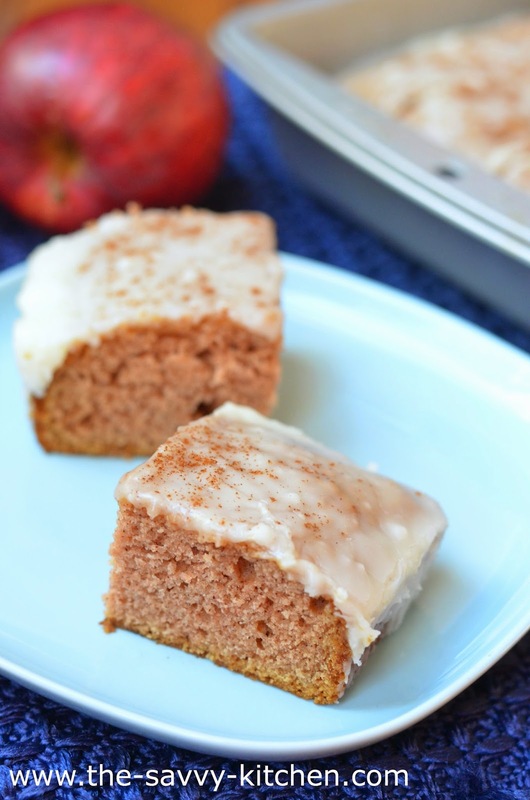 I used some homemade applesauce for this cake, and it was amazing. The cake was moist, and the glaze was perfectly sweet with just the tiniest hint of rum flavoring. Definitely perfect for fall. Enjoy! Grease an 8×8 inch cake pan. Preheat oven to 350 degrees. For cake, melt butter in medium-sized saucepan and cook over medium for about 2-3 minutes until it just starts to turn brown. Remove from heat and stir in sugar, applesauce and vanilla. Stir in dry ingredients and stir until just combined. Pour into prepared pan and bake for 30 minutes. To make glaze, melt butter in small saucepan and cook over medium heat for 2 minutes, again, until just turned brown. Remove from heat, stir in remaining glaze ingredients and pour over warm cake. Sprinkle with additional cinnamon. Serve cake warm. Eat and enjoy! 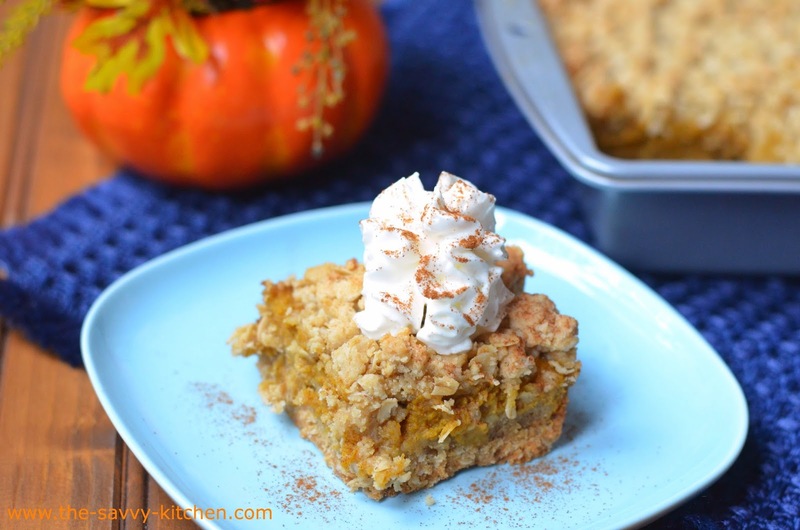 'Tis the season for pumpkin EVERYTHING! Seriously. Everything. I've seen pumpkin English muffins, creamer, candles, peanut butter, ice cream, donuts, air fresheners. Where do they come up with this stuff? There's one thing I haven't seen sold in a store that I highly suggest starting off your pumpkin baking with. 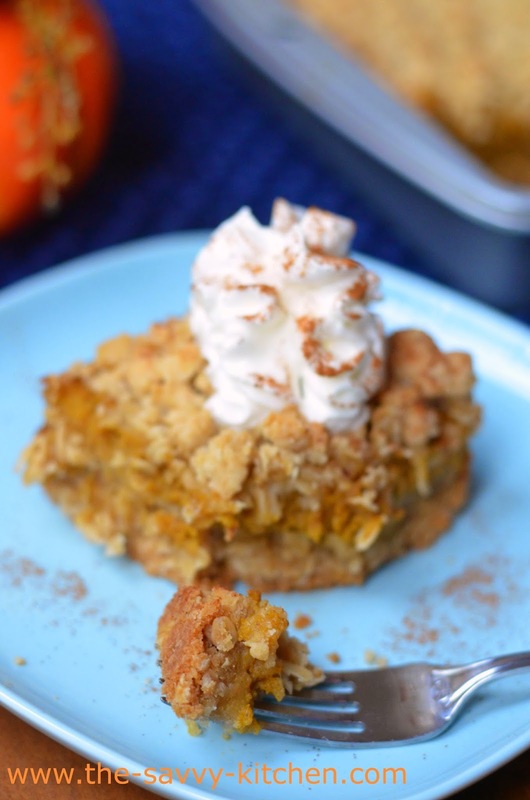 It's part pumpkin pie, part oatmeal cookie, and totally amazing. 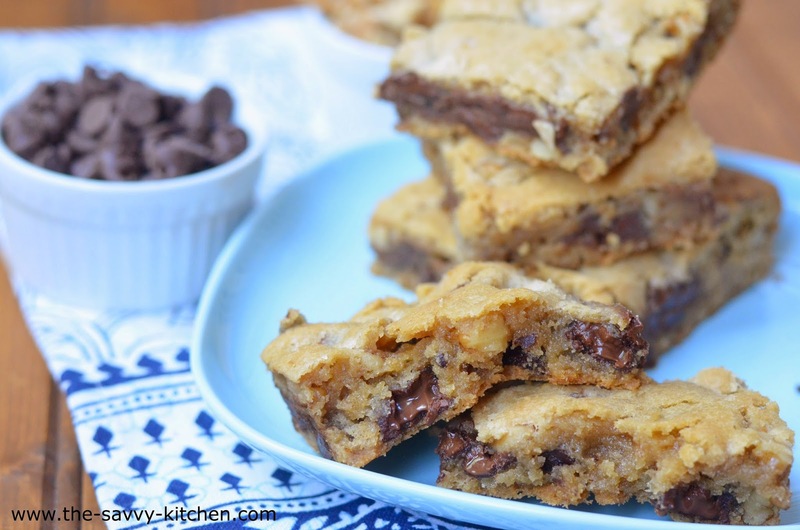 These bars are decadent and delicious. I even think they're good enough to take over the traditional pumpkin pie on your Thanksgiving table. They're that good. Enjoy! Preheat oven to 350 degrees. Grease an 8x8" baking dish and set aside. In a mixing bowl, whisk together flour, oats, salt and baking soda until well combined. Add in 1/2 cup granulated sugar and 1/2 cup brown sugar an mix until no clumps remain. Combine melted butter and vanilla and add to mixture, then stir with a spoon until evenly moistened. 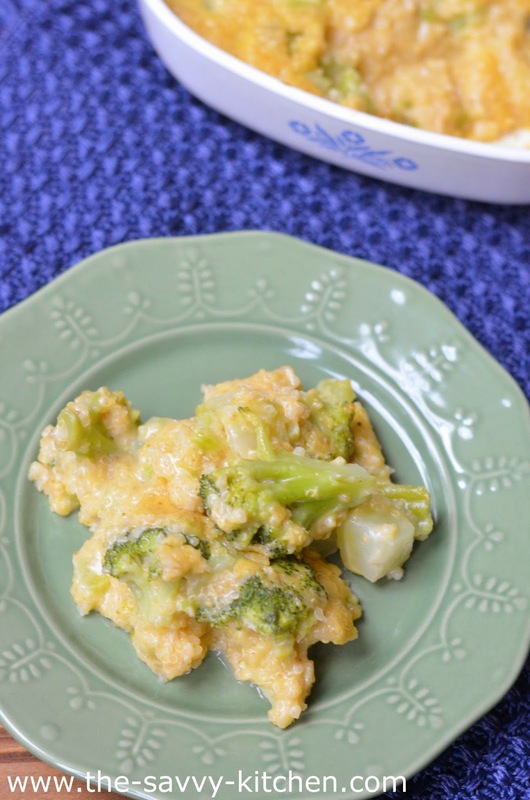 Gently press half of the mixture into prepared baking dish and bake in preheated oven 15 minutes. Meanwhile in a mixing bowl, whisk together 1/4 cup granulated sugar, 1/4 cup brown sugar, cinnamon, nutmeg, ginger, cloves and salt. Add in egg, egg yolk and vanilla and stir until blended. Mix in pumpkin then milk. 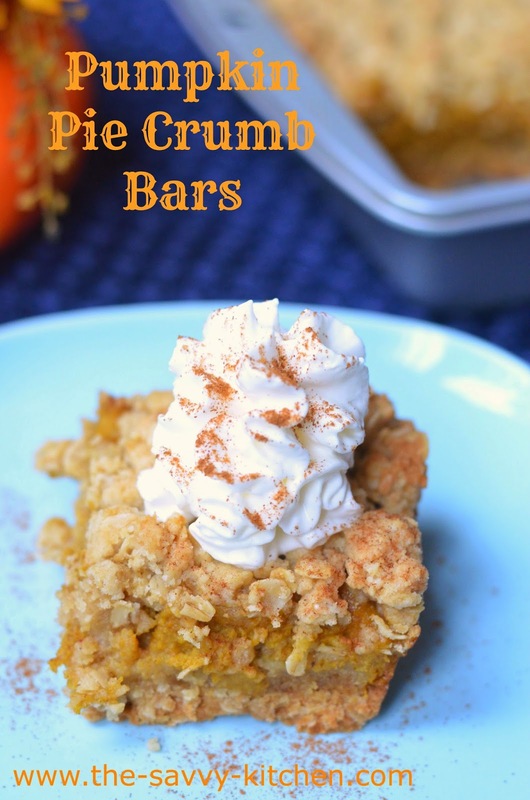 Pour pumpkin mixture over baked cookie portion and return to oven to bake 15 minutes, then remove from oven and sprinkle remaining cookie crumb mixture over top while breaking the crumb into small bits. Transfer oven rack closer to the top-center (not directly beneath but a few levels below) and return to oven to bake about 20 - 25 minutes longer until golden on top and center only jiggles slightly. Remove from oven and allow to cool 1 hour at room temperature, then transfer to refrigerator to cool 1 hour longer (or serve warm from the oven like a crumble with ice cream). 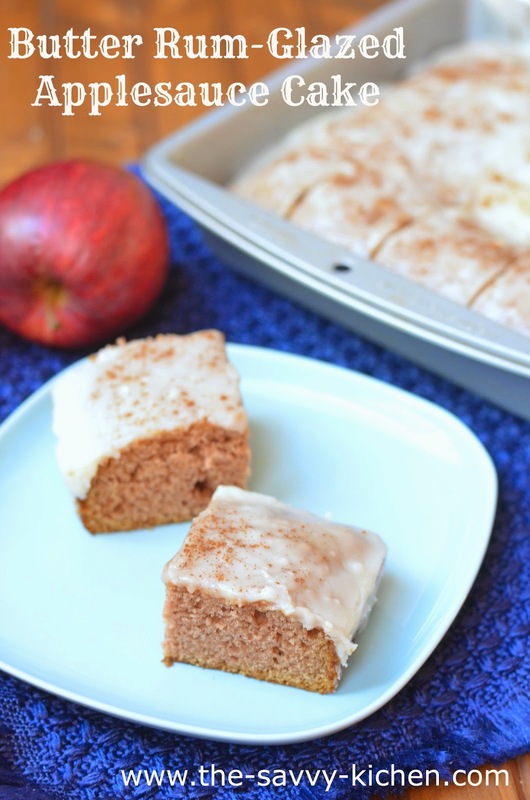 Cut into squares and serve with sweetened whipped cream and a light dusting of cinnamon if desired. Comfort food means different things to different people, but to me it means food that I would not eat on a daily basis. Food that makes my waistline expand. Food that makes my mouth water. Food that makes me feel warm and fuzzy inside. 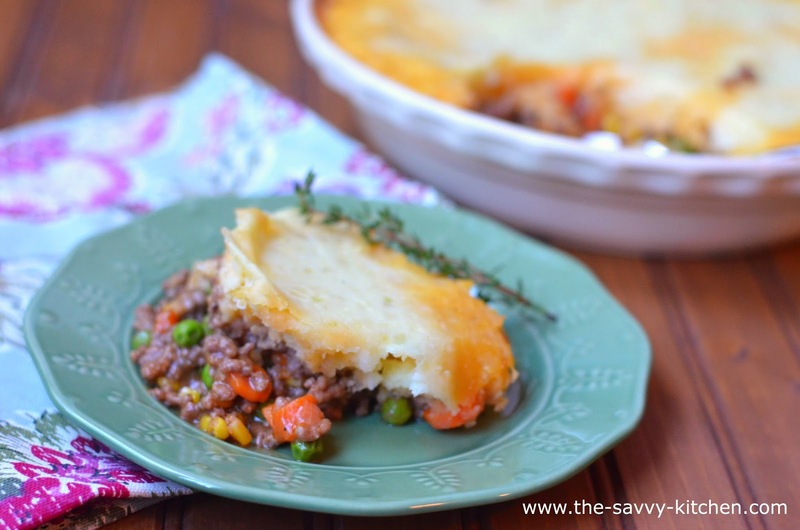 Food that is quick and easy to prepare, but tastes like it took all day to make. 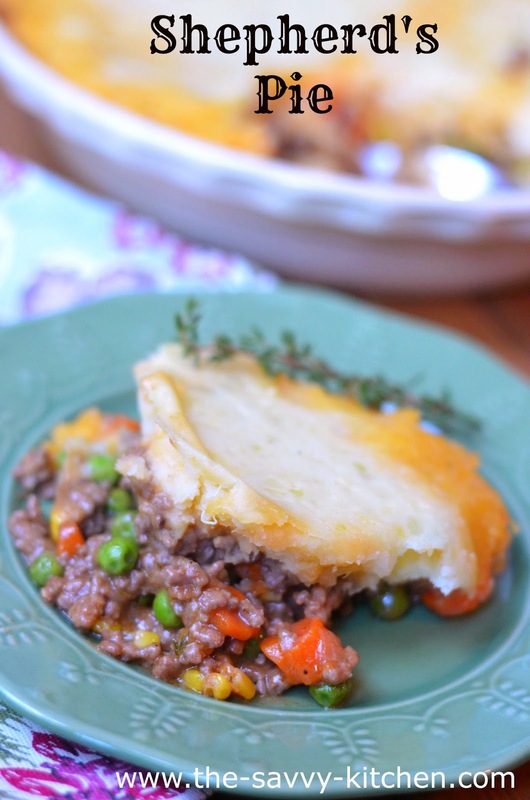 Shepherd's Pie fits the bill perfectly. It warms the tummy and satisfies the palate. Tons of vegetables are packed into the mix, which worked out well for me since Bradley ate a ton of this. I used beef instead of lamb since that's what my family prefers, but you can always swap it out if you'd rather have lamb. 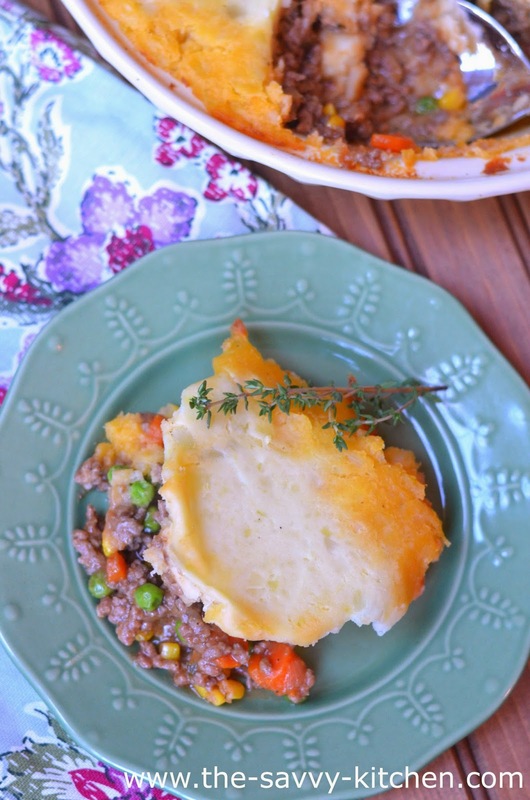 Make this on a chilly fall night--it has comfort food written all over it! While the potatoes are cooking, prepare the filling. Place the canola oil into a 12-inch saute pan and set over medium high heat. Once the oil shimmers, add the onion and carrots and saute just until they begin to take on color, approximately 3 to 4 minutes. Add the garlic and stir to combine. Add the beef, salt and pepper and cook until browned and cooked through. Remove all but 2 tablespoons of grease from the pan. Sprinkle the meat with the flour and toss to coat, continuing to cook for another minute. Add the tomato paste, chicken broth, Worcestershire, rosemary, thyme, and stir to combine. Bring to a boil, reduce the heat to low, cover and simmer slowly 10 to 12 minutes or until the sauce is thickened slightly. Chris has been on the hunt or something new and portable to take to work in the morning, and since I had an abundance of apples on hand I wanted to use them up. 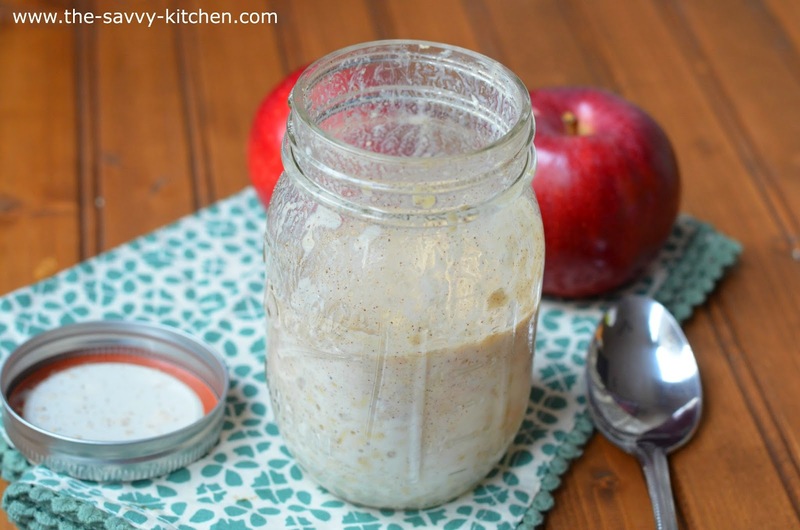 Apple Pie Oats in a Jar are the best thing since regular Overnight Oats in a Jar. 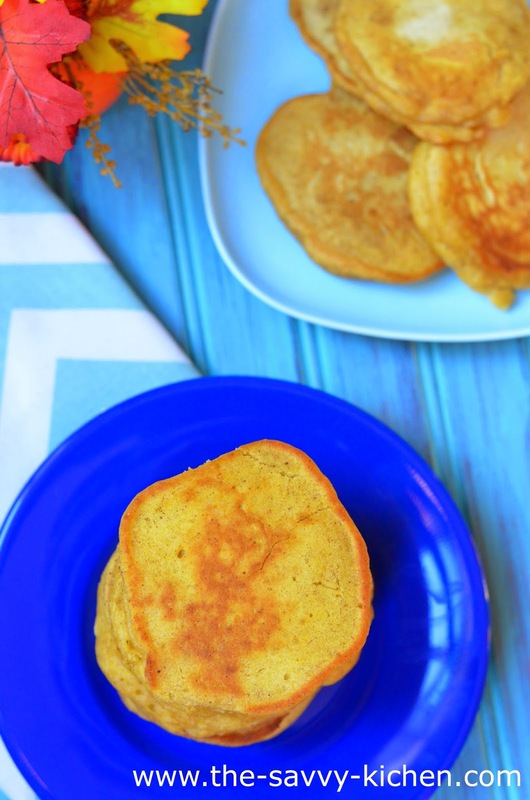 They are easy to whip up and taste ah-ma-zing. 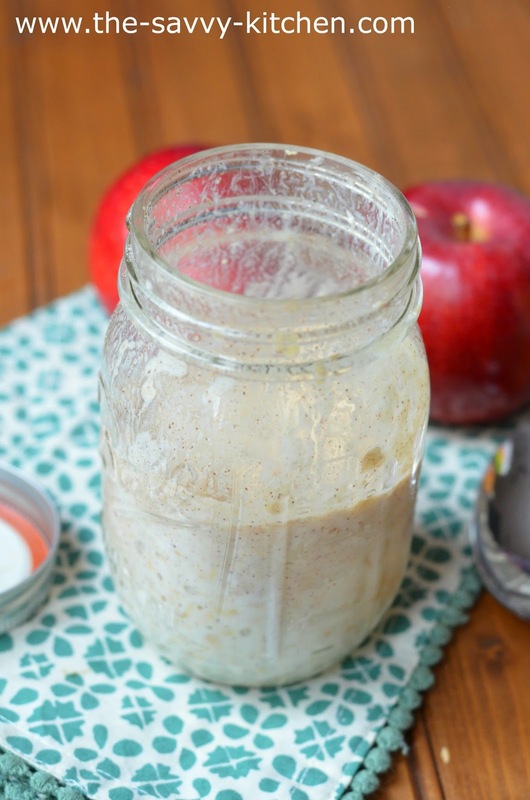 Seriously like apple pie in a jar. But cold. And not pie. But it tastes like pie! 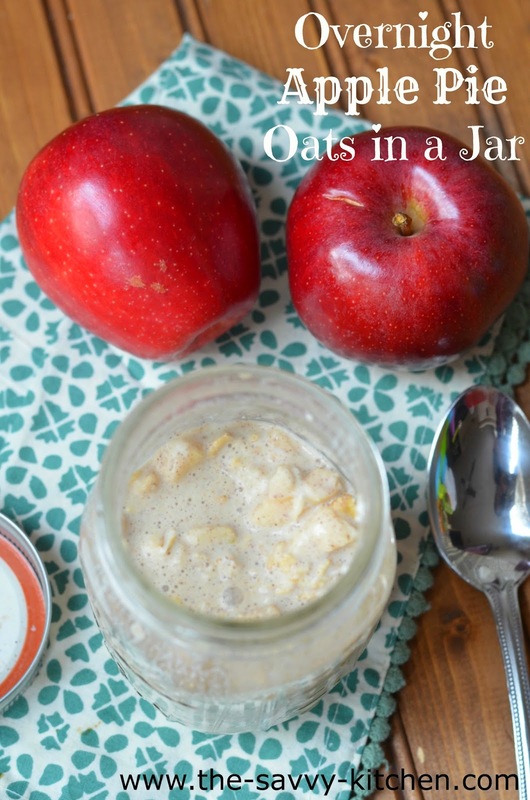 I love making these in cute Mason jars since they are easy to transport and you just pour everything in, screw on the lid and shake it up! All three of us really enjoyed this fall morning treat. I made a few one night (which, by the way, only took 5 minutes) and we had breakfast ready for the next few days. It was awesome. Enjoy! In a Mason jar, mix all ingredients. Shake to combine. Let sit overnight in the refrigerator. Enjoy cold! Since I found myself in the mood for some cookie dough (when am I not in the mood for cookie dough? 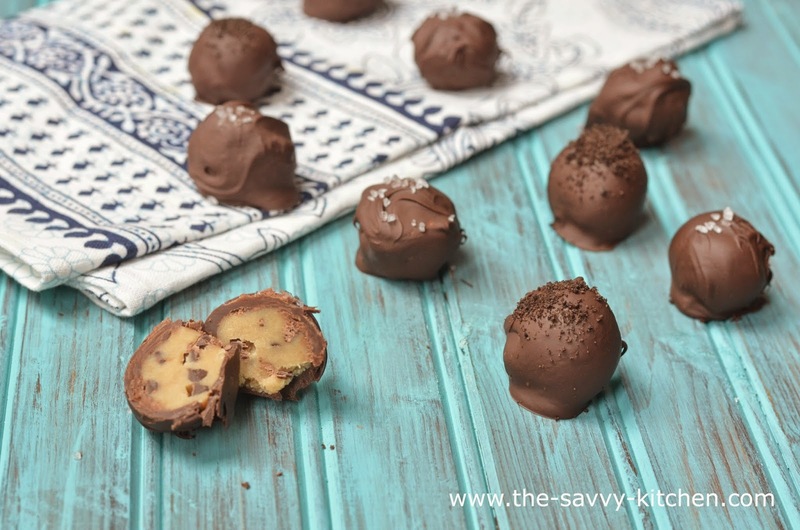 ), I went with these super simple truffles. The cookie dough is sans eggs so it's safe enough to eat on it's own. Then it's dipped in chocolate and sprinkled with cookie crumbs or sea salt. Yep. I went there. Enjoy! Line a baking pan with wax paper and set aside. In a large bowl, blend butter, brown sugar and vanilla with a hand or stand mixer until light and fluffy. Add flour, 1/4 cup at a time, incorporating well after each addition. Fold in mini chocolate chips with a spatula. Roll the dough into 1-inch balls and place on the prepared baking sheet. Once all balls are formed, place in the freezer for 30 minutes. 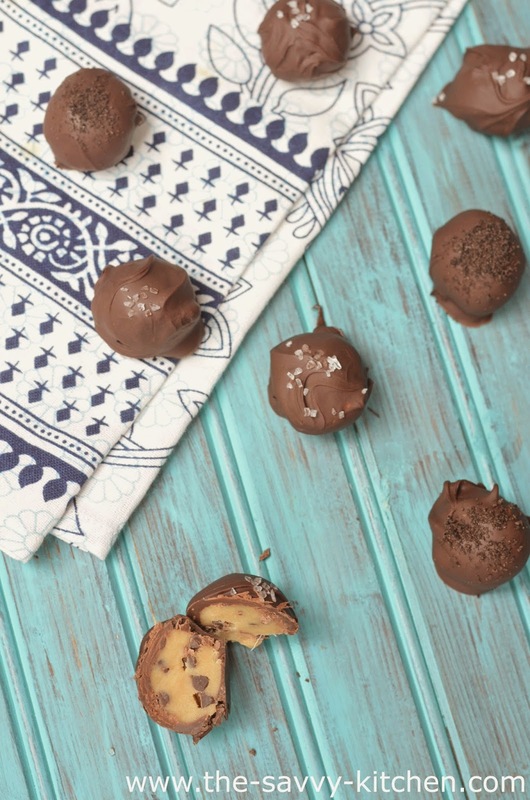 Place the bag of regular size chocolate chips in a microwave-safe bowl. Microwave for 30 seconds. Stir and continue microwaving in 15-second increments until fully melted. 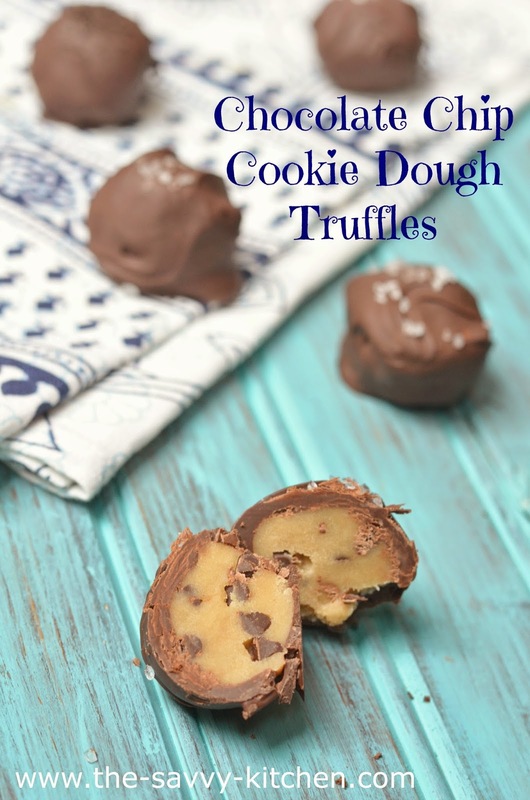 Remove the cookie dough balls from the freezer. Dunk in the chocolate and use a fork to coat. Place the chocolate-coated ball on the end of the fork, and lightly tap on the edge of the bowl to remove excess chocolate. Place back on the baking sheet and sprinkle with cookie crumbs or sea salt. Repeat with remaining dough. Place in the refrigerator for 1 hour or until chocolate is set. Store in an airtight container in the refrigerator. Chris had to work very late the last week in September, so Bradley and I were on our own for dinner most nights. We went on a mother-son date, went to my parents' house and had a few quick dinners at home. Most of our at-home dinners consisted of me making Bradley a healthy dinner and then browsing the freezer for my own dinner options. I don't know what it is, but I can never motivate myself to make a big dinner for myself when Chris isn't home. Needless to say, I'm very happy he's going to be around for dinner from now on. I don't know how many Lean Pockets a girl can eat! My mom recently made roasted broccoli, which Bradley LOVED, so I decided to put it into the dinner I made for us one night. I figure I should try to incorporate it into his diet as much as I can, right? 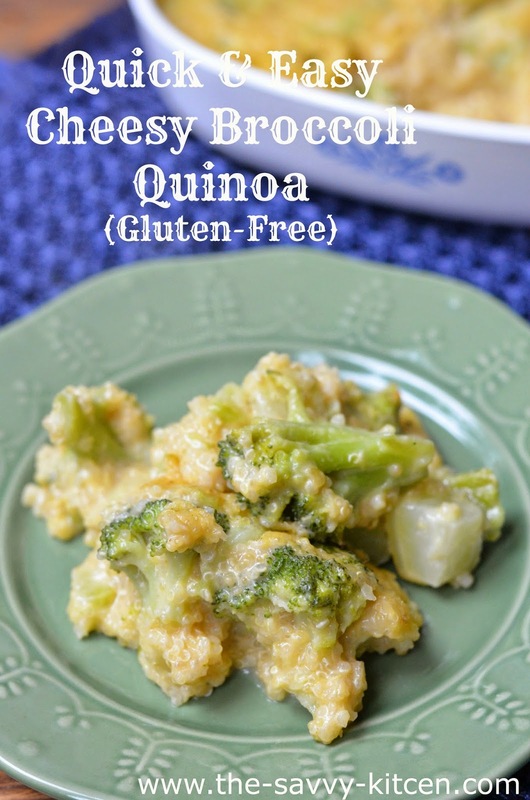 Since he also loves cheese, I made us a cheesy quinoa dish with steamed broccoli. He loved it. (Obviously. There aren't many things this kid doesn't like.) And this was one night where I finally passed on the Lean Pockets and enjoyed a home-cooked meal myself. Thank goodness. Enjoy! Rinse quinoa well using a fine mesh strainer. Combine quinoa and water in a small pot. Bring to a boil. Cover and reduce heat. Cook for 15-20 minutes, or until quinoa is tender. During the last 7 minutes of cooking, add broccoli. When quinoa is done, drain the quinoa and broccoli in a fine mesh strainer. Meanwhile, melt butter in a small pot. Sprinkle flour over butter and whisk for about 1 minute. Slowly add in milk, whisking constantly. Continue whisking until mixture thickens. Add cheese and stir until melted. Add seasoned salt and pepper. Taste and add more seasonings, as needed. 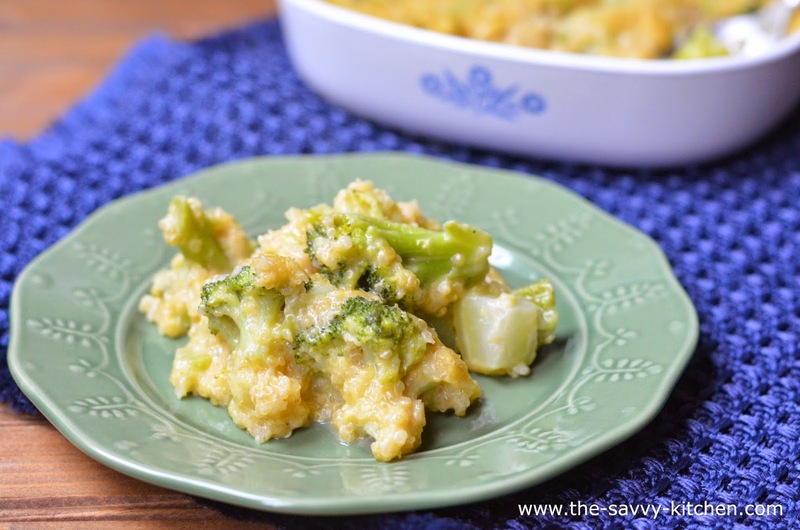 Add quinoa and broccoli to a large bowl. Cover in cheese sauce. Serve immediately. 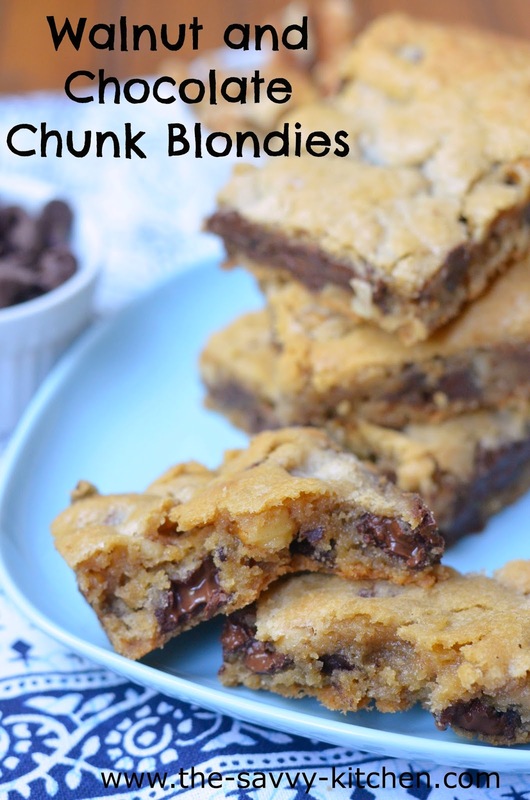 Blondies are a girl's best friend. Well, maybe just my best friend--I won't speak on behalf of all girls. But they are so dang good. Chocolate? And butter? And brown sugar? You need to make these. Like, yesterday. 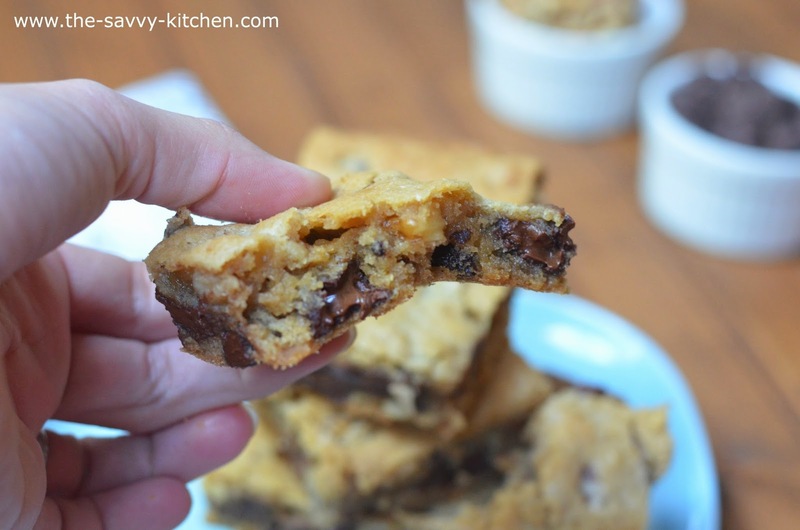 They taste pretty similar to chocolate chip cookies, which is thanks to all that brown sugar. That delicious, glorious brown sugar. But they're not cookies; they're bars. And they are SO so moist. Just to add a little extra crunch and deliciousness, walnuts are also tossed into the mix. You can leave those out if you really want to, but I love 'em in there. Just in case you need to hear it again, these bad boys are SO stinkin' good. Enjoy! Preheat the oven to 350 degrees. Grease 9x13-inch baking pan and set aside. In the bowl of an electric mixer fitted with the paddle attachment, cream the butter, brown sugar, and granulated sugar on high speed for 3 minutes, until light and fluffy. With the mixer on low, add the vanilla, then the eggs, one at a time, and mix well, scraping down the bowl. In a small bowl, sift together the flour, baking soda and salt and with the mixer still on low, slowly add flour mixture to the butter mixture. Fold in the walnuts and chocolate chunks with a rubber spatula. Spread the batter into the prepared pan and smooth the top. Bake for 30 minutes exactly. Don't overbake! A toothpick may not come out clean. Cool completely in the pan and cut into bars. 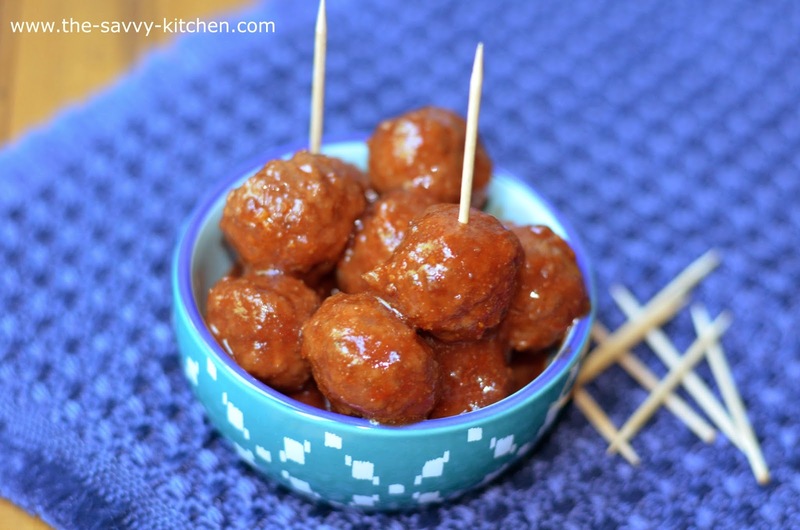 I've been to many potlucks where these meatballs were served, and they were always the dish that everyone raved about. I absolutely love them too, so when putting the menu together for Bradley's birthday, they were the first thing on the list. 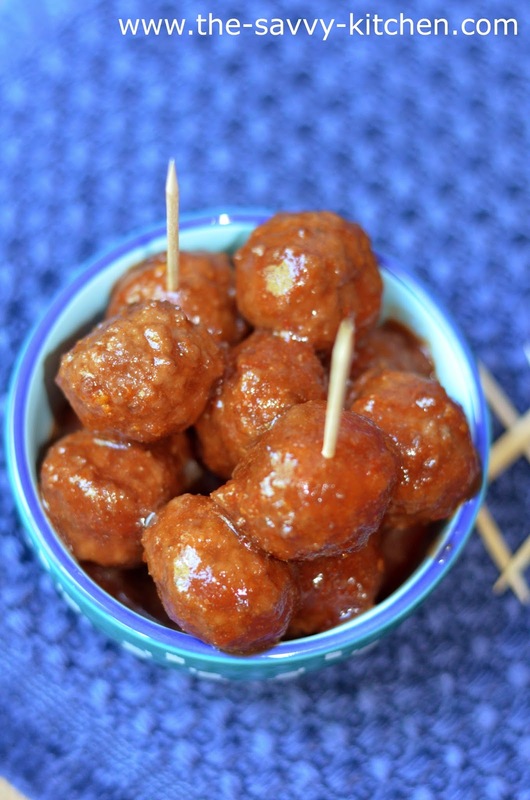 These are great for a potluck or some effortless game day food. Pour all the ingredients in your slow cooker and let it go. 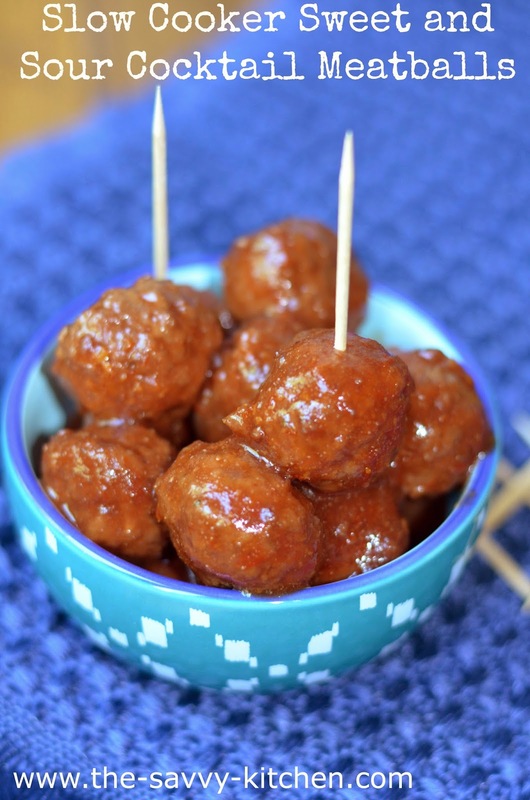 The result is tender meatballs coated in a thick sweet and sour sauce. Everyone will love these and I'm pretty sure they'll be the first thing to go. Enjoy! Combine chili sauce and jelly in a slow cooker and stir well. Add meatballs and toss to coat. Cover and cook on low for 3-4 hours. Bradley loves animal crackers, so I obviously wanted some on the snack table for his birthday party. I thought it would be fun to serve a dip alongside these, so that's where this dip came into play. 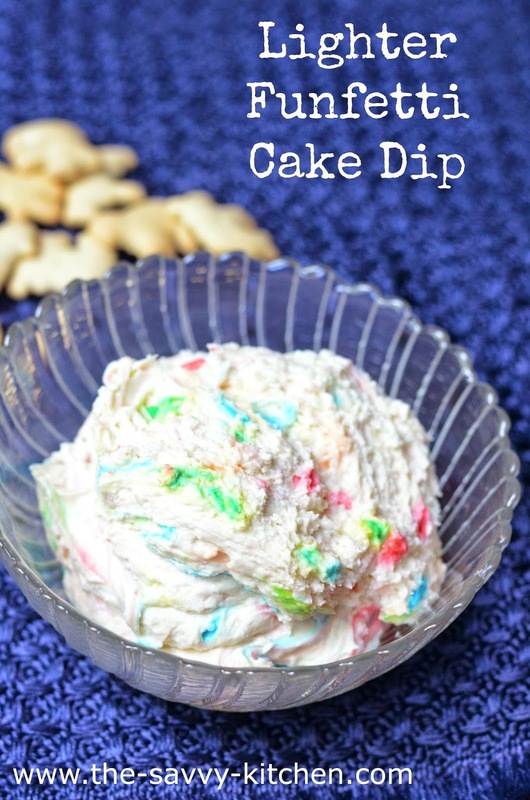 I think everyone and their mother loves funfetti cake, so using it in dip form is just genius. And it really compliments the animal crackers! 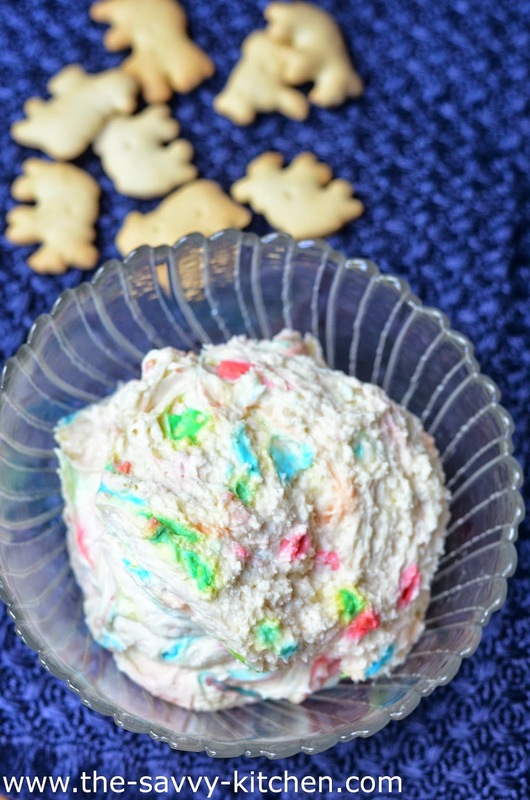 This is a fun and easy dessert for both big and small kids. And you only need three ingredients! Some cake mix, yogurt and cool whip is all you need for this tasty dessert. Everyone at Bradley's party loved this and it was a great addition to the dessert table. It's also a nice sweet treat in addition to your game day food. Chris compared this to the old classic "Dunkaroos," and who didn't love those? Enjoy! Place all ingredients in a large bowl and stir well. Refrigerate for at least 2 hours before serving. 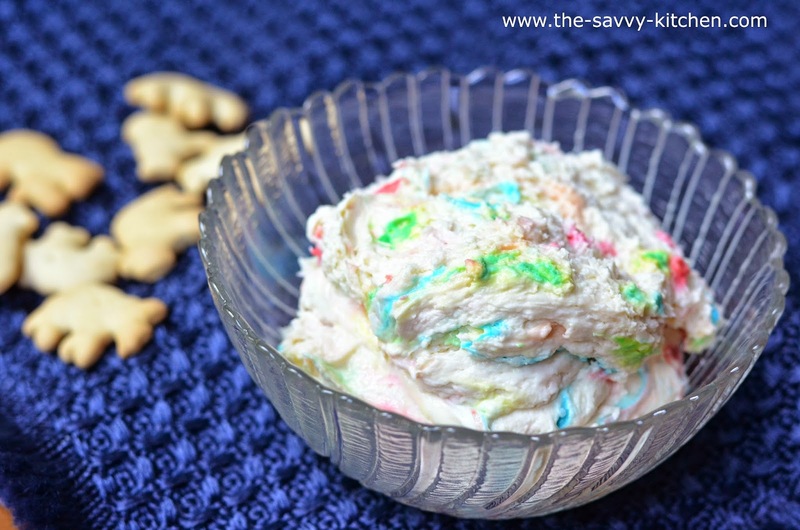 Serve with animal crackers or vanilla wafers.